A study of the pigment molecules that give color to the wings of butterflies, led by two City College of New York professors and two former students, was published in the science journal PLOS ONE. The paper, "Different ommochrome pigment mixtures enable sexually dimorphic Batesian mimicry in disjunct populations of the common palmfly butterfly, Elymnias hypermnestra", was authored by Professor George John of the Chemistry Department and Professor David Lohman of the Biology Department, with Silvio Panettieri who earned a Ph.D. in Chemistry from the CUNY Graduate Center and Erisa Gjinaj who graduated with a B.S. in Chemistry from Macaulay Honors College while working in John's lab at CCNY. The scientists identified the pigment molecules that give color to the wings of mimetic butterflies, those that mimic the behaviors or appearances of other insects. Although there are about 18,500 butterfly species, wing pigments from only a limited number of butterfly species have been chemically characterized, focusing on a small number of species many years ago, the authors point out. Few studies seek to explore the full extent of butterfly diversity to look for novel pigments and determine their chemical identity. Most of the compounds identified in this study are new to scientific literature, and several lines of evidence point to a conclusion about the evolution of different mixtures of pigments. Mimicry, in which one species imitates another in appearance, odor, behavior, or some other trait, is widespread and takes diverse forms. In butterflies, model species are often avoided by predators because host plant-derived compounds render them distasteful, but model species might be avoided for other reasons, such as evasive flight maneuvers. Within a given area, predators learn to associate unpleasant taste or uncatchable species with particular visual cues. With varied, brightly patterned wings, butterflies have been the focus of much work on the evolution and diversification. The CCNY scientists characterized the orange wing pigments of female Elymnias hypermnestrabutterflies from two Southeast Asian populations. 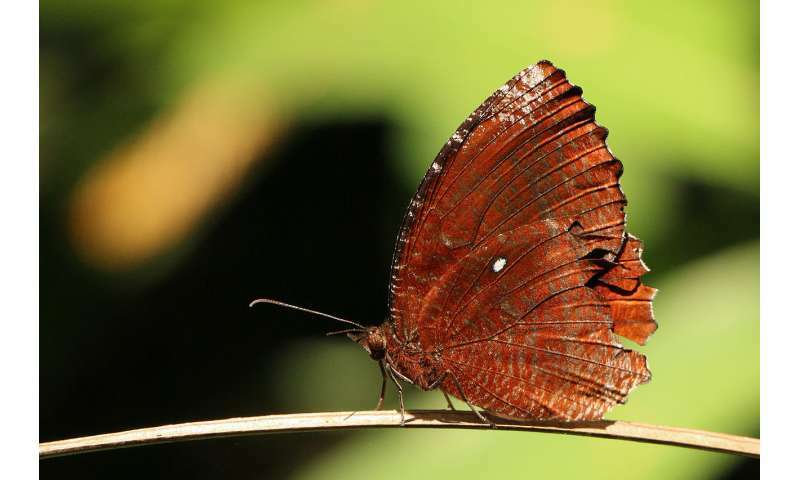 Identifying pigments from butterfly populations in Thailand and Indonesia, which gave specimens different shades of orange on their wings, the scientists hypothesized that different pigments are responsible for differences in wing coloration. The findings suggest local adaptation or parallel evolution where mimicry generates changes, and more pigments remain to be discovered.